SalesforceIQ offers a variety of ways to share your communication to ensure that your team is always in-sync. Note: Sharing is available only for Organizations with at least two users. Check out our Sharing articles for more detailed information. Sharing email and calendar activity lets you instantly see when anyone on your team last reached out to a Contact, where you left the conversation, and who should be taking next steps. Note: You can also share Contacts, as described here. To protect your privacy, all sharing in SalesforceIQ is off by default. You need to enable sharing at the activity level and then, if you choose, at the content level. Activity includes emails, meetings, and calls. When you set your activity sharing preference, you're deciding whether you want to share that these activities took place. When you enable activity sharing, other people in your Organization can see if and when you're communicating with any Contact, but not the content of that communication. Alternatively, turning activity sharing off hides the email or meeting from the Stream entirely. 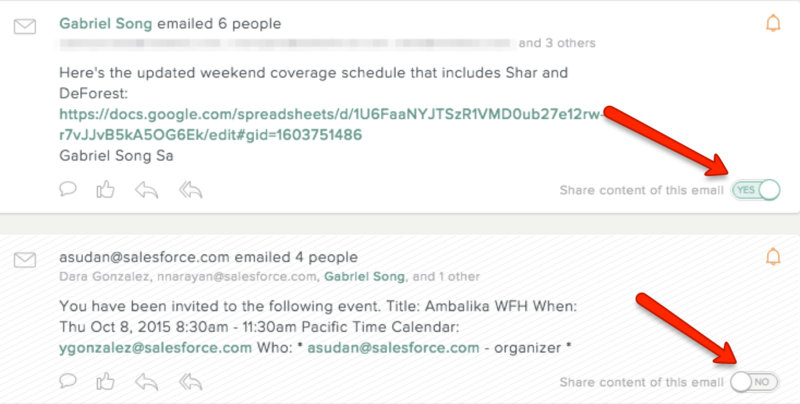 Note: Your activity sharing setting applies to your communication with Contacts on all Lists in your Organization. If you decide to turn activity sharing off, neither you nor your colleagues can see that an activity took place. If you choose to share content, the body of the email or meeting is visible to your teammates. You can enable content sharing in the Sharing tab in the Settings, the Contact profile, or the Sharing tab in the Stream. On an ongoing basis, you can set specific content sharing settings for every point of contact as they are added to SalesforceIQ. Note: Regardless of the content sharing settings you choose below, incoming or outgoing emails containing the words Confidential, Private, Personal, or Privileged in the subject are always unshared by default. You can choose to turn content sharing on for a specific private email in the Stream. Use the steps shown here to turn activity sharing on or off at any time. We recommend that you enable activity sharing. On the screen that appears, click Sharing. Switch the View and Share Your Activity in the Stream option to Yes or No. Note: You can also turn content sharing on and off for individual Contacts in the Android and iPhone mobile apps. Click at the top of the screen, and then select Settings. Click Sharing on the left side of the screen. To share content from all of your Contacts, click All Contact Sharing Settings. To share content for new Contacts that you or a colleague added to a List, click New Contacts to Approve. You can set the sharing option for individual Contacts to Yes or No, click All to share content with all the Contacts displayed, or click None to share content with none of the displayed Contacts. You can also click Show stream to view the Stream for a given Contact. Note: If a Contact has more than one email address, you can turn on content sharing for one, some, or all of the addresses. To turn off content sharing for all of your Contacts, click New Contacts to Approve and then click None. Click at the top of the screen. In the orange banner that appears notifying you that new email addresses need to be reviewed, click the sharing settings link. A pop-up window appears displaying all of the Contacts that you have had previous communication with that have been added to SalesforceIQ since you made your last set of sharing decisions. Make your content sharing selection for each Contact. Note: You can also turn content sharing off from a Contact's profile page. Search for the Contact in the Search field in the upper-right corner of any SalesforceIQ screen. Click the Contact name, and then select your content sharing preference. 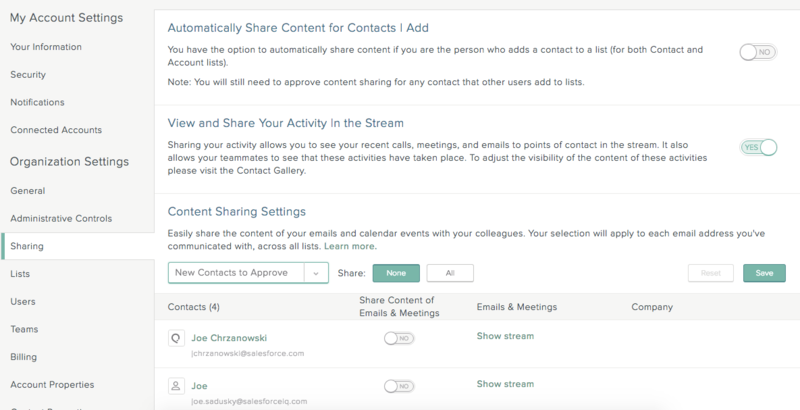 After a user enables activity sharing, users can decide whether to share the content of individual emails and meetings. If you are comfortable with sharing all of the content of your emails, you can choose to automatically share the content for any Contact that you add to a List. Switch the Automatically Share Content for Contacts I Add option to Yes or No. You can choose to share or hide the content of an individual email in the Stream. This overrides your contact level content sharing settings. Open the Stream view and scroll to the event. Set the option to share the content of the email to Yes or No. Note: You can select individual emails to share from the Android and iPhone mobile apps as well.